Recently I met a man named Barry that made awesome wooden plaques with his scroll saw. I’m talking beautifully carved pieces of wood with intricate detailing! To my shock, he’d never even heard of Etsy. But it happens: someone has an amazing ability to make something so rare, so beautiful, or they find the best unique treasures, and they don’t know a thing about getting it out into the world for other people to pay them for it. The good news–I believe Barry has since started an Etsy shop! Woo hoo! We here at Thrift Diving are creative souls. We love vintage stuff. We appreciate antiques when other people simply see junk. And if you’re reading this blog, chances are, you probably make stuff and love vintage finds, too, right? If you’re new to The Wonderful World of Creating, this post is for you, too. One day you’ll consider selling your work or thrifted finds, so listen up. So I had been wanting to put together a little guide to share here for all of you who make awesome stuff, or maybe you find the cutest vintage goodies, and you’d never thought to sell them online. Or maybe you’ve wanted to, but just didn’t know how. First, let me explain to you what Etsy is. It’s basically a place where you can find handmade items, vintage goods, and craft supplies you can’t find anywhere else. Doesn’t matter if you make quilts, paint furniture, sell vintage bowls from the 1950’s that you find at the thrift store, make jewelry or toys–whatever–there is a place for your stuff on Etsy. As long as it’s either handmade, hand-finished, vintage, unique, or rare, you can sell it on Etsy. Instead of just selling to your neighbors and your kids’ PTA, now you’ve got the whole world to sell to, right at your fingertips. Ahhh….don’t you love the internet?? I’m not really an Etsy seller (although I have made two sales). I’ve dibbled and dabbled in it, but I’ve never committed to it enough to make it work. 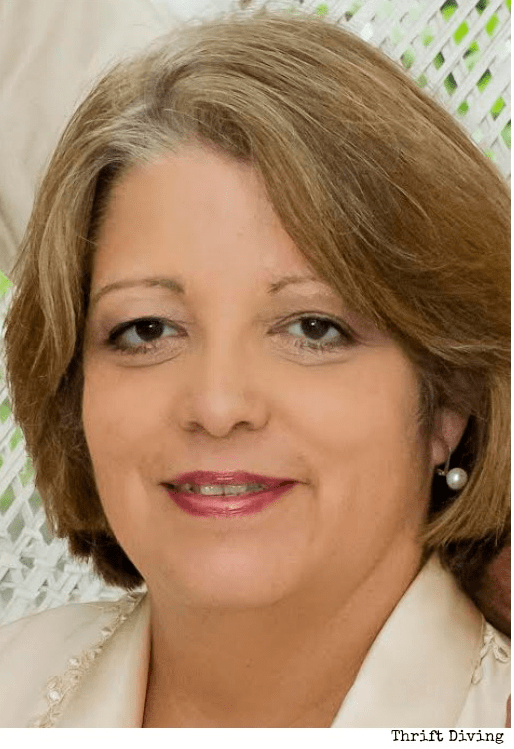 If you recall, she was one of my previous Readers of the Month because, well…she’s awesome. During her interview for Reader of the Month, one thing that stood out to me is the success she’d been having with her shop on Etsy. She’d told me that she planned to make selling on Etsy a stable source of income for her family once she retires. I was intrigued because I knew that Etsy was hot and I wanted to know more about how she makes it work for her. Most importantly, I wanted her to share what she knows to help you guys set up your own successful Etsy shop, too! So instead of making things and having them sit around your house collecting dust, you might actually be able to make some dinero from your craft or love of vintage goods! Hi, I’m Letty and welcome to my Etsy World. 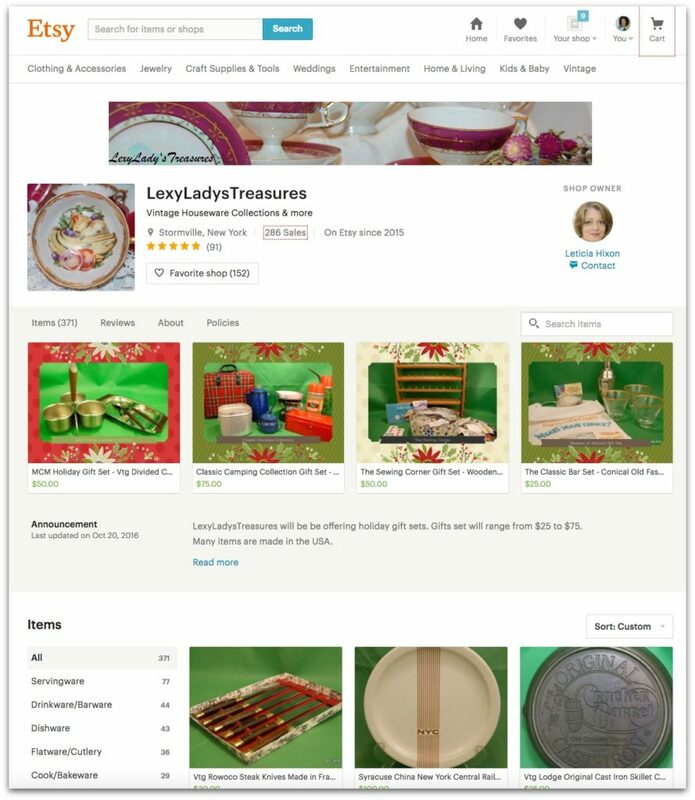 I joined Etsy on April 24, 2013, but it wasn’t until February 8, 2015, that I started my 1st shop, LexyLady’sTreasures. 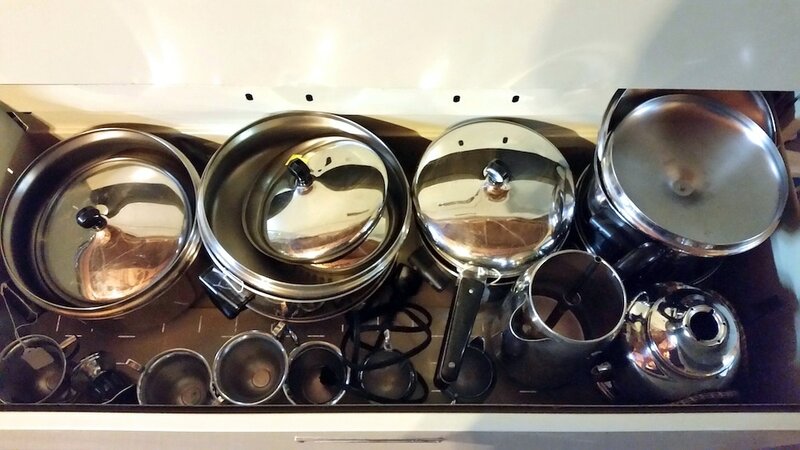 I mainly sell vintage household goods such as flatware, serving pieces, dishes, glassware, and pots and pans. I also throw in barware, vintage linens, books, and lamps for good measure. When I started my Etsy shop, my goal was to eventually have some income so I could retire early. 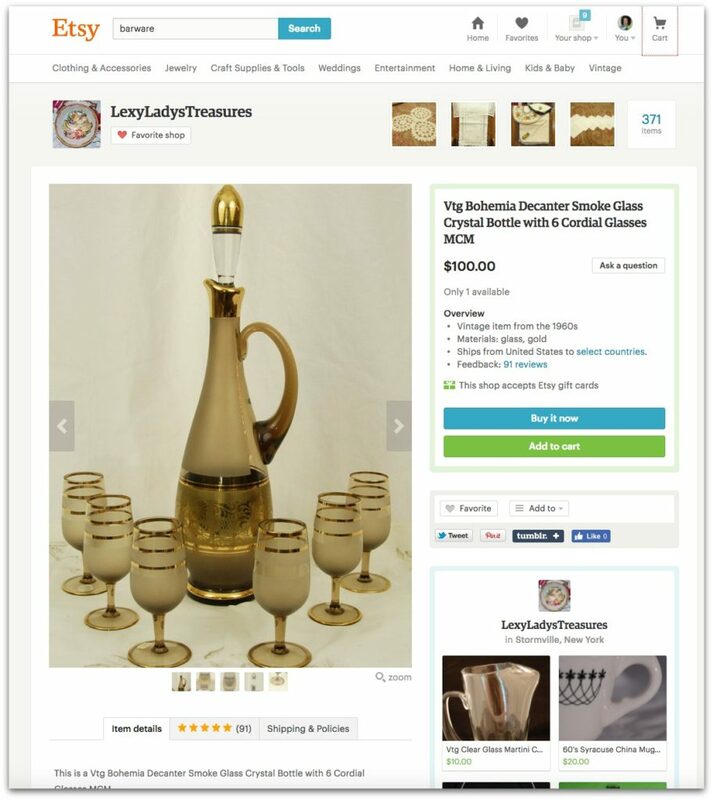 Where did you get the idea to start LexyLadysTreasures? My original idea for my shop was to sell silver plated flatware. I figured it was easy to store, easy to ship and not breakable. My son, who has his own shop and is my mentor, would obtain silverplate at auctions for me. My job was to clean it up, identify the pattern, photograph it and list it. But once you start going to auctions, estate sales and tag sales, you see so many beautiful items that you want to get it all. So now I have 338 items in my shop with about another 100 that I need to list. What are the first things someone should do to set up an Etsy shop? I created a bank account. What are the other important things to do to set up an Etsy shop? Someone on a Facebook board just asked about what are the most important things to do to set up an Etsy shop. If you want to be taken seriously as a shop owner, then you need to take your shop seriously. In order to grow your business, you have to work it – every day. Take great pictures, write honest descriptions, make it as unique as you can and provide the best customer service. There are so many resources out there. What sells fast in your Etsy shop? Selling is a funny business as you never know what people are buying and why. I have plenty of barware in my shop but one of my best sellers are glass swizzle sticks which are hard to find. As soon as I list them, they sell. Tea cups are usually a good seller. Many bridal and baby showers are held around a “Tea Party” theme, so people are looking for vintage tea cups to set a pretty table. I stay clear of Beanie Babies, collectible plates, certain dishware. 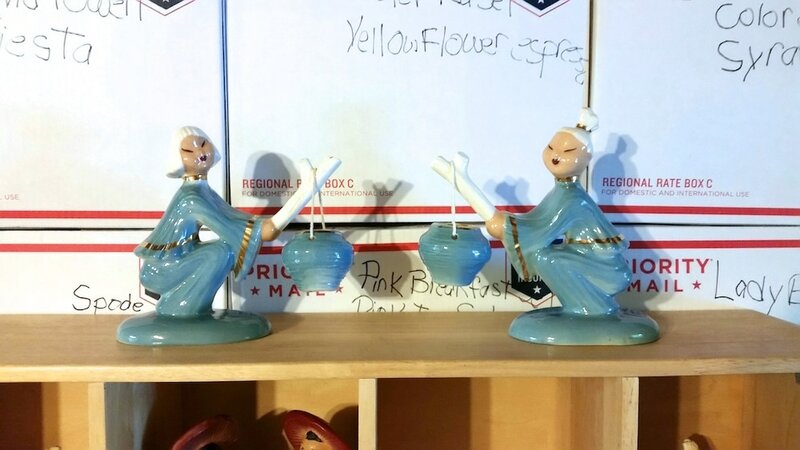 These are Asian ceramic sculptures that are for sale. How much does it cost to sell things on Etsy? Starting an Etsy shop is free. They don’t charge you to open the shop. When you want to list an item for sale, it only costs $0.20, and that listing doesn’t expire until 4 months (so think it as $.05 for just one month!). 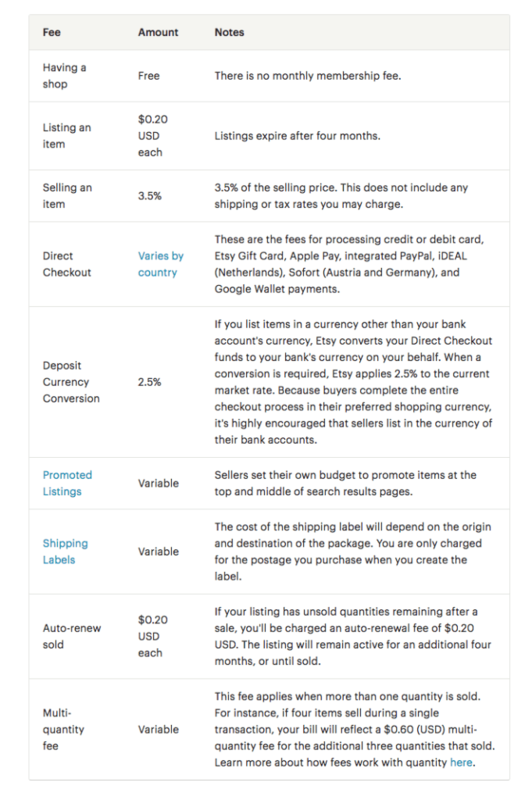 When the item sells, Etsy charges a fee of 3.5% of the selling price. 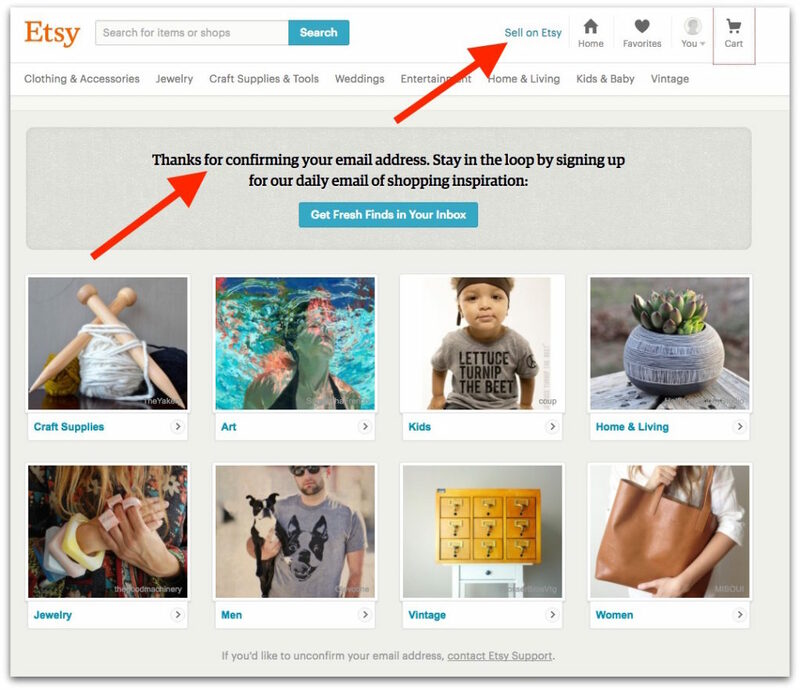 You can click here to learn more about how Etsy collects fees. What Facebook groups should people join for resources and support? How do you store your inventory? My hubby is listed as “Buyer Extraordinaire” in my shop. He is always scouring Craig’s list for items for our home, my shop and for our kids. 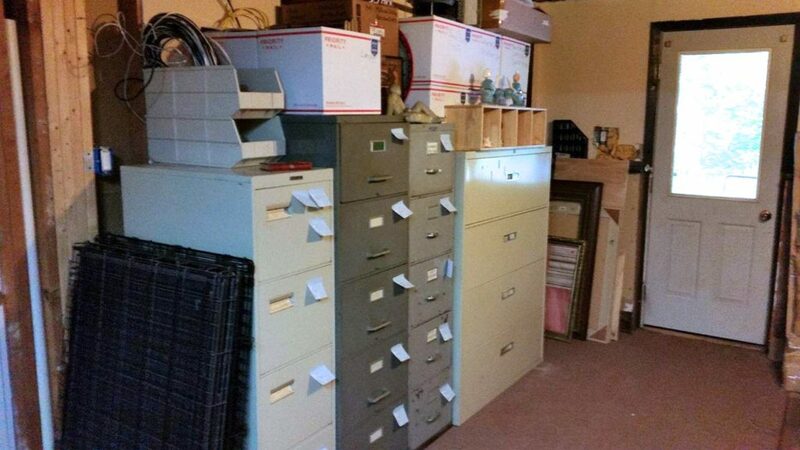 He has scored over 15 filing cabinets – all for FREE – from Craig’s List over the past 18 months. Eight of those are mine and that is where I store my inventory. I recently took over our family room (it is the one room in our house that we have never even put a paintbrush to) as my business headquarters. 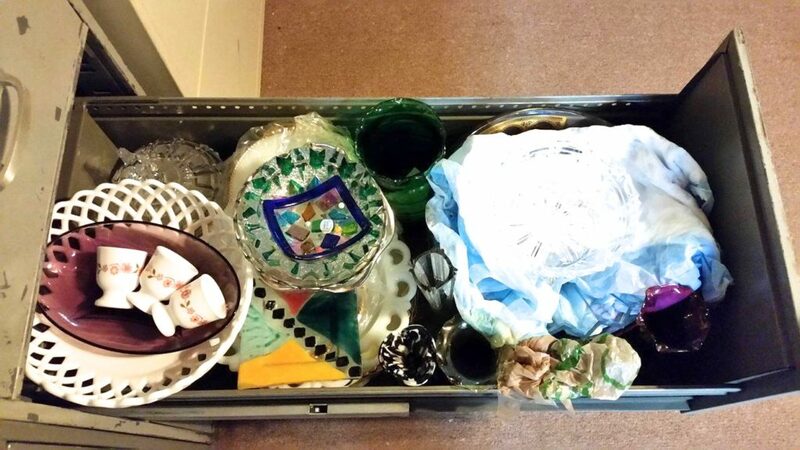 I keep similar items together – all pots and pans in one filing cabinet, linens in one tote, and glassware on shelves. Someday, I will incorporate a number system but for right now I can manage to find everything. 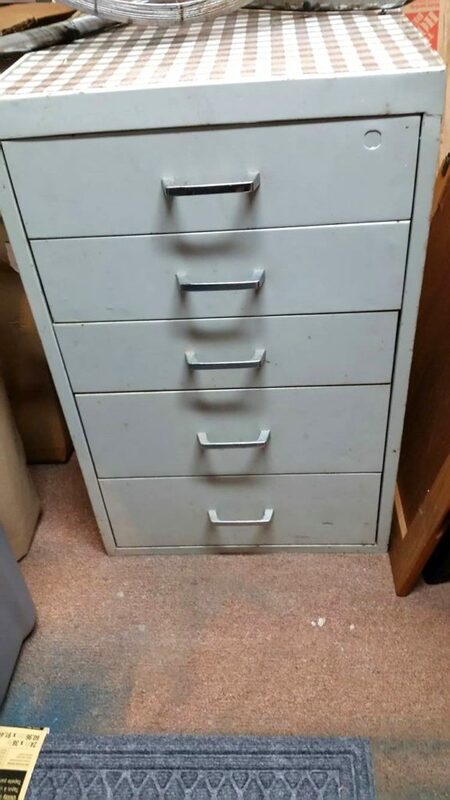 This is where I store my flatware. How do you ship stuff to customers? Shipping my goods was a real learning experience. I definitely lost out on some profit by not charging sufficient postage. By trial and error, I have learned to better judge how much an item will weigh once it’s packaged. There is a good website – Flippertools.com, that has a tool called FitShipper that quickly helps you determine the cheapest box to mail your item. I also have the perk at work to use UPS Business to Business shipping which greatly cuts down on shipping some bigger heavier items. Do you use social media to promote your Etsy shop? I don’t truly understand all the mechanics in advertising on the different social media sites. 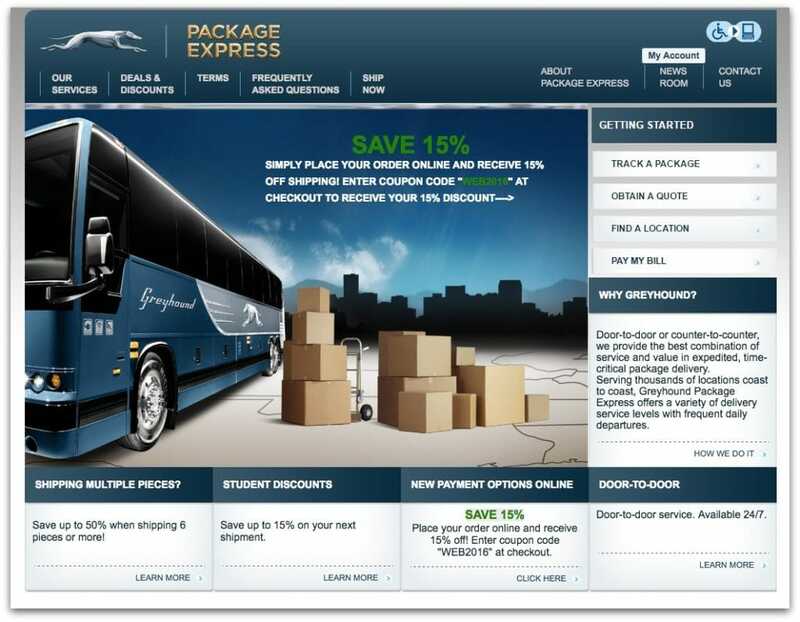 I do know that listing and updating your site every day gives your shop more exposure. I do occasionally pin to Pinterest and add posts to my shops Facebook page. I recently did a post on Instagram for my second shop LavenderEarthStudio. I sell handmade/upcycled items and digital photos in this shop. It is still a work in progress. Since I still work full time, I try to spend about an hour each evening and more time on the weekends tending my shop. I need to allow time for sourcing inventory, cleaning items, identifying them, photographing them and then listing them. When an order comes in, I have to package it, add shipping labels, make arrangements for Postal pick up, and then add the sale to my spreadsheet. I may spend 5 hours just photographing, weighing and measuring several items. Another day I may be researching several patterns or items. Other days are for just listing. How many sales have you made so far? Since 2015, I’ve made 287 sales! 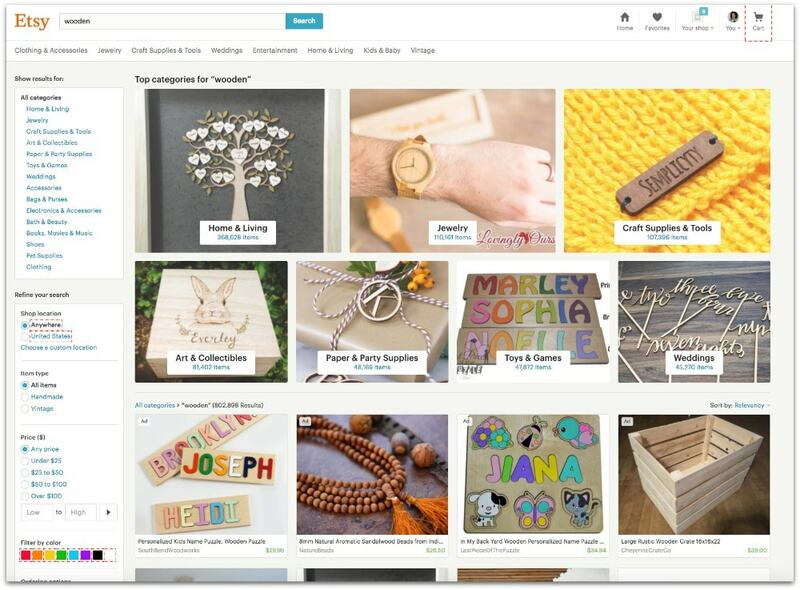 What are three things that someone could do today to get started with selling on Etsy? If someone wanted to sell on Etsy today, here are 3 things they should do. Research what you think you want to sell. My “go to” place is Ebay SOLDS to see what has sold and for how much (see below). Is the market flooded with these items? Or have you found a nice niche? 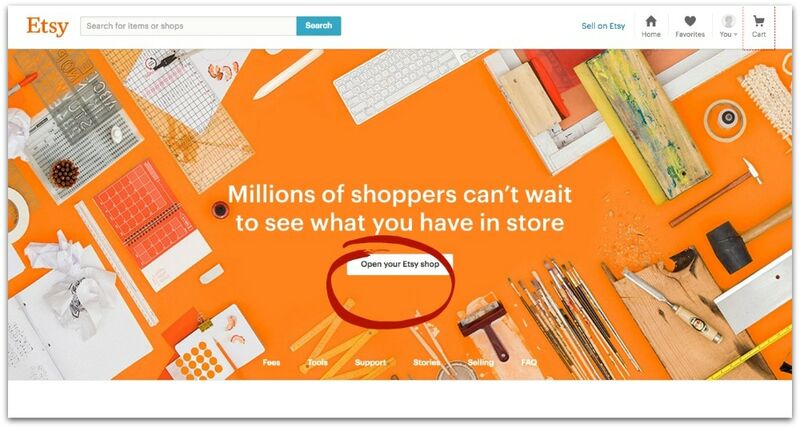 Honestly, determine how much time you can devote to your shop. My kids are grown and out of the house. My husband is retired and can help me in many areas (he likes the shopping part). Remember: you will get out of this what you put into it. 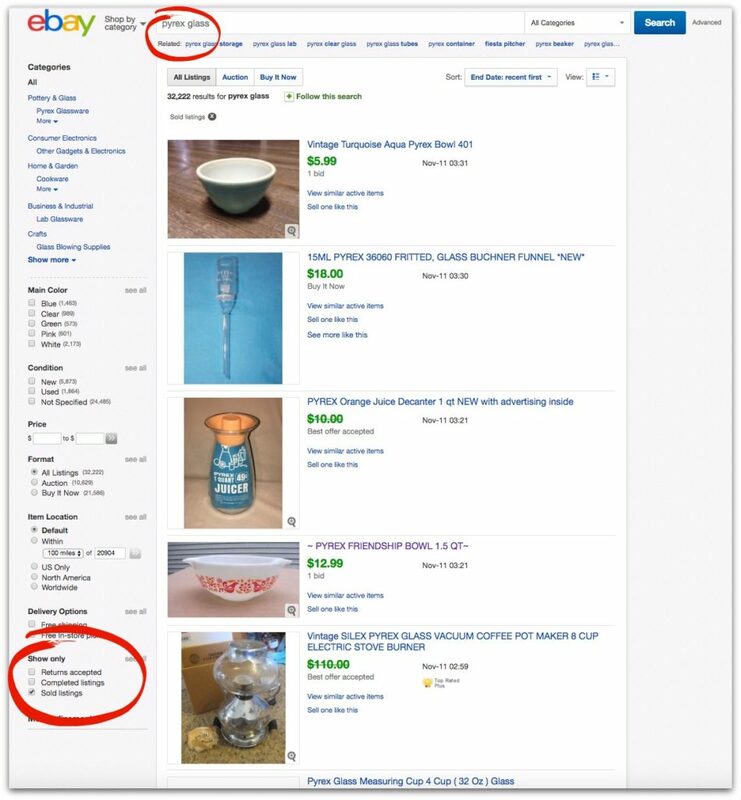 Follow some selling sites such as The Thrifting Board or connect to other Etsy sellers through the Etsy forums. So how do you actually set up an Etsy shop? 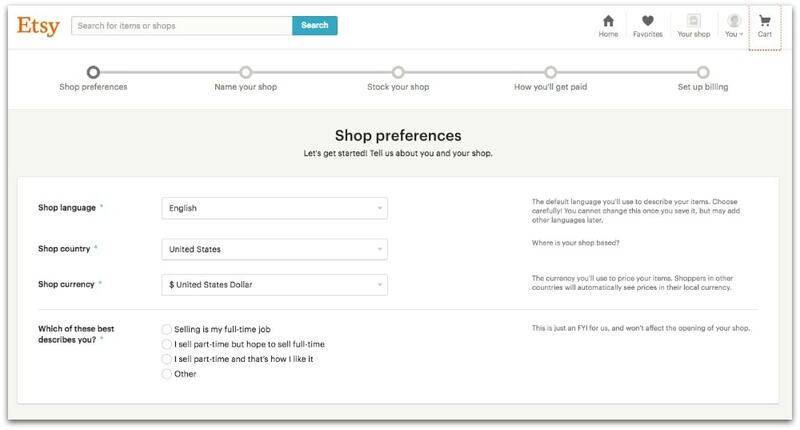 With just a few steps, you can be set up in a matter of minutes with your shop! Go to Etsy.com and click on “Register” at the top right-hand corner. 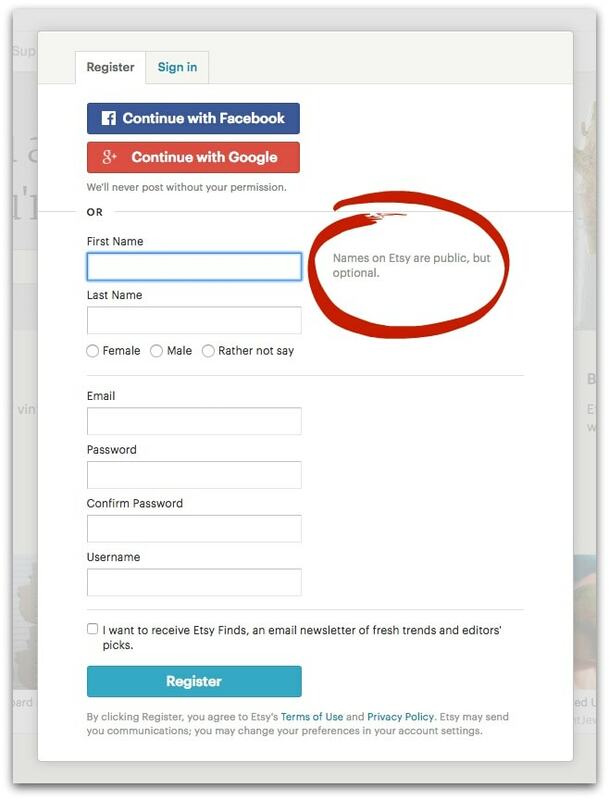 You’ll be able to login with Facebook or Google, or simply create an account without linking to Facebook or Google. I’d recommend using your real name, even though it’s optional. If you want customers to trust you, your real name matters. Before you can get started with setting up your shop, you have to confirm your email address. Once you login to your email and confirm, it will route you back to Etsy with a confirmation message. 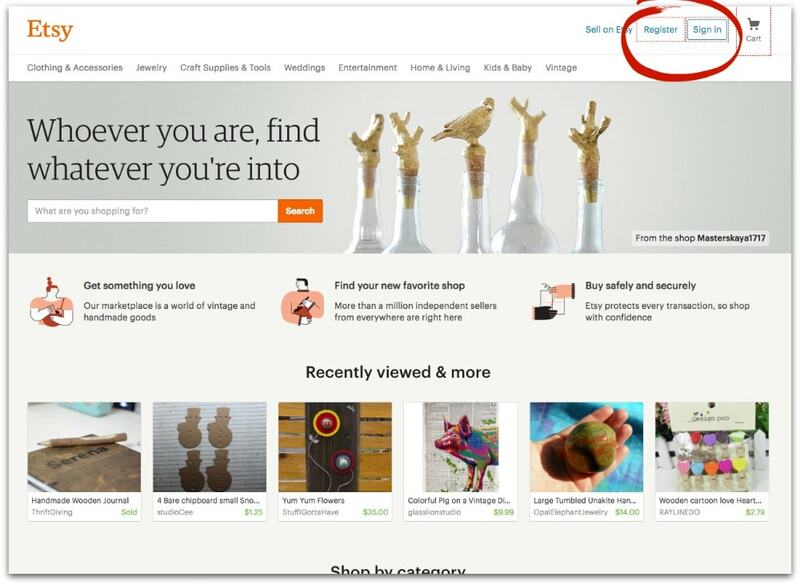 In the picture above, click on “Sell on Etsy,” you will be prompted to open your Etsy shop. Answer just a few short questions about your preferences. Now it’s time to name your shop. I really love that Etsy provides a link (circled in red below) where you can get some ideas on how to pick a name for your Etsy shop! Names are important since that is the first thing people are going to notice about your shop. Click here to read those Etsy tips on choosing a name. 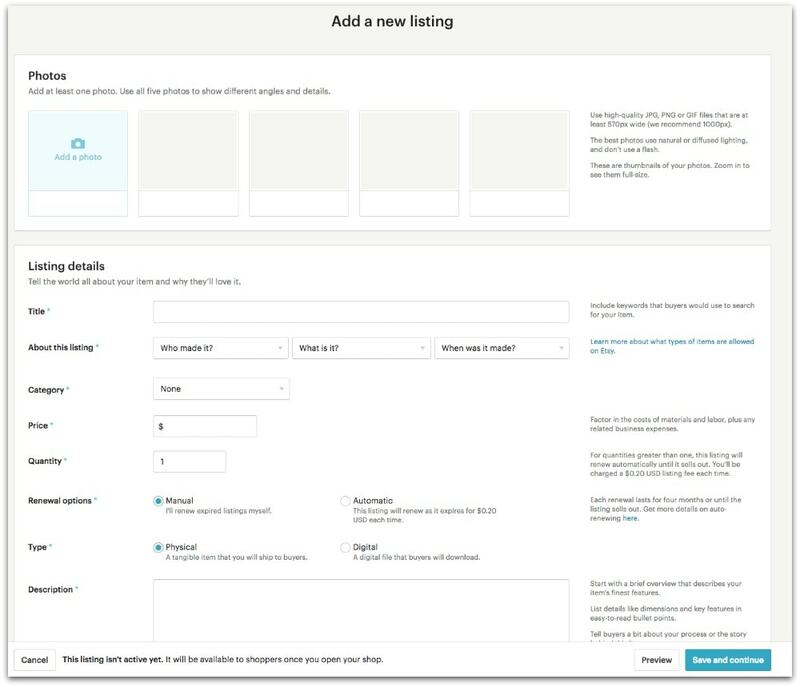 Now you’re ready to add listings to your Etsy shop! Be sure to use high-quality photos! Use free photo editing software like PicMonkey.com to edit your photos if you need to lighten them, crop them, etc. Remember: the prettier the pictures, the better! Be descriptive, honest, and unique in this section! Add as many relevant tags as you can think of. 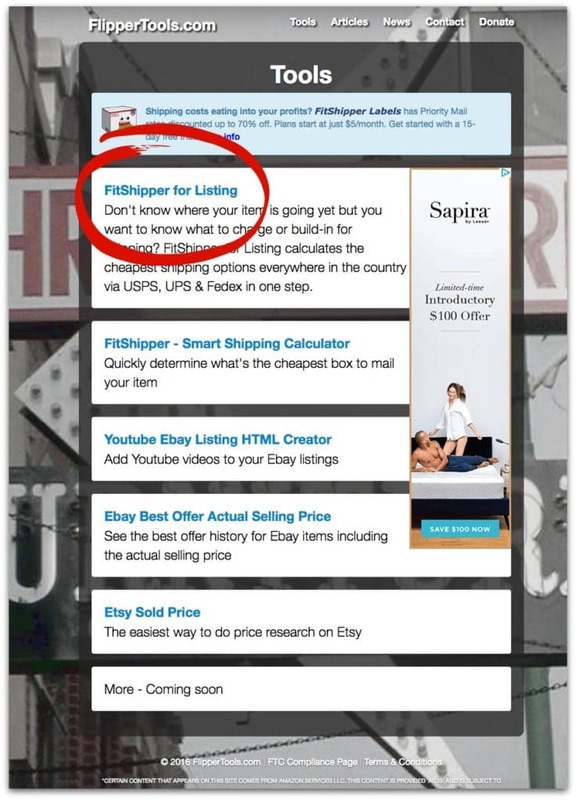 The more tags you enter about your listed items, the more people can find your listing when searching! The next step is to set up how you want to get paid when you make sales. Etsy is a safe website, so your financial information is protected. You’ll also have to set up billing. Be sure to use that business account or business credit card, so that any sales and fees can be easily tracked for tax purposes! Once you’ve set up your financials, that’s it! You’ve now got an Etsy shop! They’ll email you a confirmation that you’re all set up! Now all you have to do is start and commit. Big thanks to Letty for walking us through her experience as an Etsy seller and how to set up a shop! As she said, you’ve got to be committed to it. It’s like nurturing any business–it takes time, dedication, and a desire to succeed. And I love that she’s planting her seeds now to have this support her when she retires. Way to think ahead, Letty! It also helps that she loves doing what she’s doing. Have you ever thought of starting an Etsy shop? Do you already have one? Tell us about your experience with selling your crafts and unique finds online! Great info! I tried to start a shop a couple years ago, but I didn’t have enough time to devote to it. Hoping to reopen in the next year. Informative post! Thanks for sharing the information. I used to have an Etsy store but sadly it lapsed. Oh wow, what were you telling, Tammara? As an Etsy seller myself, I enjoyed this post & learned some things in the process. Yes it is a lot of work, but I enjoy it too. I’ve got well over 800 sales…working towards my first 1000! I usually keep around 200 items in my shop. If I had a bit of advice to offer for those thinking about starting an Etsy shop, pick a short name for your shop. Mine is “VintageSouthernPicks,” and though I love the name, it’s often been too long. I wish I had picked something shorter. Letty, if you’re reading this, it’s totally a great idea to keep your items in a filing cabinet! I love that idea! Right now, they’re on shelves, but I don’t have a good place for the shelves. Thinking about using your idea. A GREAT POST!!! THANK YOU SO MUCH! Serena, didn’t I see you in a DULUTH TRADING advertisement?????? I saw it twice, and would swear that was you using your tools on a wood pallet or something. Way to go!!!! Thanks, Barb! And yes, that was me in the commercial! I’m one of their models, although I haven’t yet been in the catalog, but hoping I make it in one day! 🙂 The commercial is my 15 minutes of fame. HAHA! I have had my own Etsy shop for almost two years. 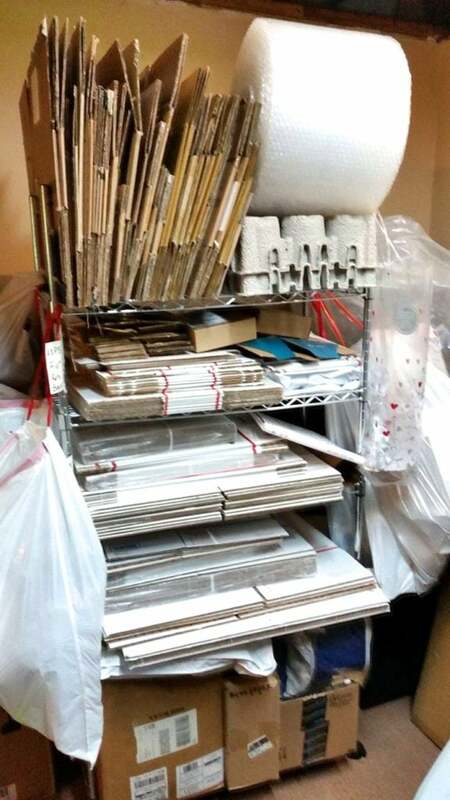 It has been fun but yes, it is a lot of work and you do need to be organized. I sell vintage items. I would not say I make a lot of money but every transaction has been a positive one and I have loved getting feedback from my customers. Definitely glad I took the plunge! This is a great guide for anyone just starting out and I learned a few things, too! Thanks, Serena and Letty. You’re welcome, Allison! 🙂 Thanks for reading it, and commenting, too! 🙂 I appreciate it! I had an Etsy shop, but so did about a billion other crafters…but I’m about ready to give it another go! I love shopping on Etsy, I feel like real people benefit from my purchase, whereas on the internet, by and large, you don’t even know who you’re buying from! ..and what beautiful stuff! Sure provides the right information to get you started. What an informative post! I’m pinning this for future use! That would be WONDERFUL, Serena!!! Can’t wait…maybe I’ll actually DO something about the info in the new year!! This post was the best! Thanks so much for posting such great information…especially from a personal view. You’re welcome! I’m so thankful to Letty for sending me everything she knows! 🙂 Feel free to post questions here and I’m sure she’ll be more than happy to answer them! 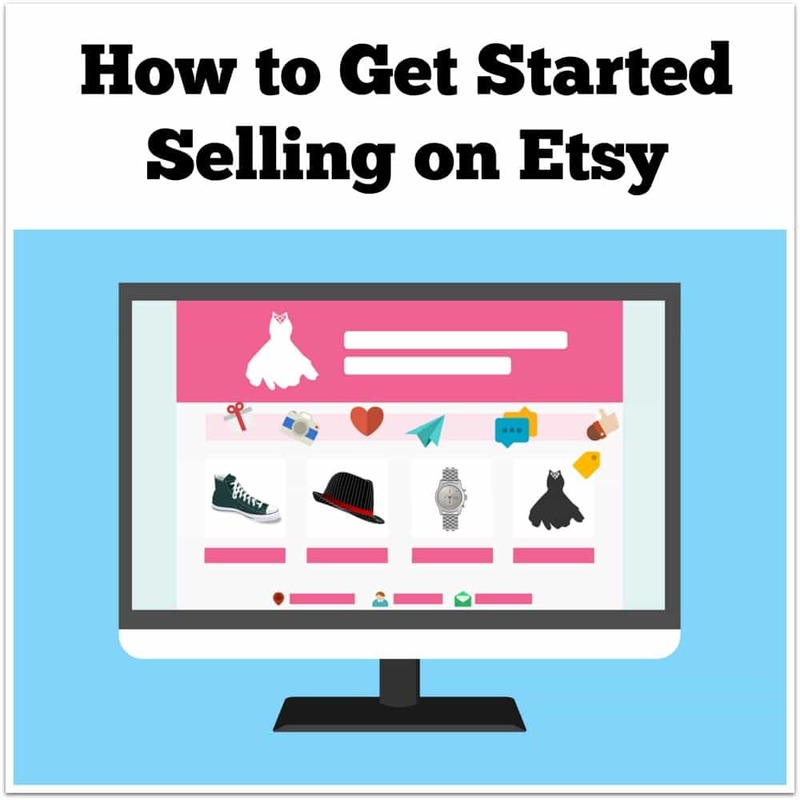 Thank you so much for the great post on how to sell on Etsy. I have been thinking of selling online and had many questions on the right way to go about it. This post covered everything. I love receiving your emails and have learned so much from your posts.